With an individual license on a Windows machine, the Volume Serial Number of the C: drive can be used as the host ID. With network licenses, the IP address can be used as the host ID. This is not recommended, as IP addresses can change due to external factors. To find your Host ID, follow the instructions below for your operating system. For individual licenses, the Host ID can be either the Volume Serial Number of the C: drive, or the MAC address of the network adapter. For Network Concurrent or Network Named User licenses, the MAC address must be used as the Host ID. Additionally, computers with a B: drive must use the MAC address as the host ID. If this produces multiple MAC addresses, use the one at the top of the list. For MacOS, the Host ID is the MAC address of the en0 device. With R2014a and later, any MAC address can serve as the host ID regardless of the interface name. If the interfaces are enumerated, use the lowest-enumerated interface. Where <interfaceName> is the name of the network interface. For example, eno1, eth0, wlan0, or enp5s0 are common Linux network interface names, although this will vary from computer to computer. For R2013b and earlier, the Host ID is the MAC address of the eth0 or en0 interface. The MAC Address is usually the value listed next to "HWaddr". If your Linux distribution does not have network interfaces which follow the enX or ethX naming scheme, you will either need to update to MATLAB R2014a or later, or change the name of your interfaces so MATLAB can detect them. Consult your distribution's documentation for instructions on changing the network interface naming scheme. Thanks a lot for this solution. I have been using Matlab on my desktop, but want it on my laptop. I have it activated on another laptop(since last year), which is unusable since the screen turns off when I open it. But that's another story. In Yosemite, the value of en1 or en0 is available under system preferences --> Network --> ethernet --> Advanced --> hardware. It is the same as the MAC address. There are 2 problems: many big mac pro machines have TWO ethernet ports. So you have to choose the right one. Laptops have NO hardware port, but the WiFi does have a MAC address, which would appear to be the thing you should use. MATLAB will try to use the lowest listed en# device, so on the Mac pro, use en0. There is a known bug on some Mac pro systems where the operating system will re-label the network adapters when the system is rebooted. If you experience a license manager error -9 after rebooting your Mac pro, please contact MathWorks support for a workaround. For the laptop, it will use wlan devices if no en# device is present. Now, I have an interesting question for you. Imagine someone has a MacBookPro or any other recent laptop with Linux- they come without wired Ethernet devices, just WiFi. How do you suggest someone activates MATLAB on such a device, where there is no eth0, or any other wired Ethernet? There is no restriction on using a wireless interface as a host ID. On a retina MacBook Pro, MATLAB will use the WiFi network interface MAC address for the host ID. MATLAB will use pretty much any network interface it can find, and activation should work long as there at least one network interface present. The terminology is a little confusing here, but all network interfaces list their MAC address after "ether" in your ifconfig output, not just Ethernet interfaces. This answer is very misleading. I am currently running OS X 10.12 and I can attest that supplying the en1 MAC address for license file generation does NOT work. If you are still having trouble please contact us directly for support so we can resolve the issue for you. I have downloaded MatLab and everything but now when I try to access it, an error pops up saying that my username does not match the username in the license file. I'm not a huge tech-guy, so could anybody give me a step process on how to solve this? Your username does not match the username in the license file. To run MATLAB on this computer, you must run the Activation client to reactivate your license. Error -9 usually means that your username that MATLAB was activated to does not match the username trying to start MATLAB. I have attached a link below that explains this error and how to resolve it. On Linux systems, the most common cause of this seems to be having answered "root" when the activation procedure asked which username to use. Another possibility is having answered with a full name instead of a username -- for example if you had replied "Luca Filippone" instead of "luca" when you ran the activation. tnks, now the error is..
Error logs successfully sent to MathWorks. What if I have only one interface lo in Linux with MAC address 00:00:00:00:00:00? Thank you very much! I tried to replace - with _ or space or completely remove it, but I still get the same error. The ID is for vol c:, and I have a d: as well, but installation is being made on c:. I tried using ID of vol d: but it does not work either. There is no "-" in the host ID. vol serial numbers have not been accepted for some time. You need to use a MAC address. If you are able to use the interactive installer then it will automatically find the host ID for you. Is there any chance the accepted answer could be updated to reflect this? This thread is directly linked from the "How do I find my computers host ID" on the activation page. It would be a lot simpler if the accepted answer contained the most up-to-date information. The Answer above, https://www.mathworks.com/matlabcentral/answers/101892-what-is-a-host-id-how-do-i-find-my-host-id-in-order-to-activate-my-license#answer_111239, lists all of the steps for the various operating systems. 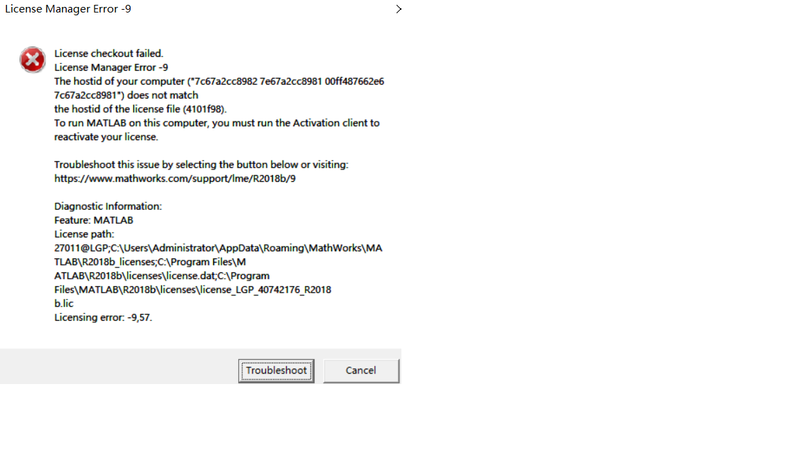 ，I have downloaded MatLab and install in my computer but now when the installation is over,i open the matlab program , there is a error as show in the picture , so could anybody give me a step process on how to solve this? The error you are receiving usually means the username you are launching MATLAB with does not match the username in the license file. In order to resolve this please re-run the MATLAB activation client and activate to the correct username. I activate. Use my standard account login name. Run matlab immediatlely after activation. Host ID keeps changing from one activation attempt to the next. It was working fine until I installed Parallel Toolbox. Linux might hypothethically have been configured for MAC address randomization. I thought about the dynamic MAC addressing, however, if you look at my inxi -n output and the MAC address from that and compare it to the supposed HOST ID that never changes. I just looked at my activated license. The activation label does reference my Wireless MAC and Host ID references the Wired so that may be the problem. Since MATHWORKS fails to propertly document or describe how the activation label works in situ with HOST ID it was not obvious at first. The disconcerting aspect is why it took several activation attempts with no reboots to "fix" with no other changes to the system. I personally gained no understanding of what I did between working and not working. I would suggest starting with a clean slate if this problem arises. Delete all the activations on the MATHWORKS website and your .lic file locally. Why MATHWORKS ever thought that using the MAC addres was a "smart" idea when it can be changed for valid sercurity reasons or at least choosing to the use the correct HW address. MATHWORKS the above is what I mean by "not smart". Which would allow us, who travel, to opt for a higher level of security. Is there a way to don't use a MAC-Address for a Linux installation? Our MatLab installations are on a bootable Stick for exams, so the problem is everytime a Stick is mounted on another Computer the MAC-Adress is not the one we licened. The Stick has no internet access! You should probably contact Technical Support about this. I do not know if it can be done.